The assignment seemed straightforward: to compare PowerPoint 2011 ( ) with Keynote ’09 ( ) by creating the same presentation in each. (Macworld did the same thing a few years ago, comparing PowerPoint 2008 with Keynote ’08.) But the more I worked with each app, the clearer it became that such feature-for-feature comparisons really miss the point. Both programs have some remarkably clever tricks up their respective sleeves—and some equally remarkable omissions. As a result, they take dramatically different approaches to many steps in the presentation-creation process. The question, then, isn’t so much which one is better overall, but rather which one has the specific set of bells and whistles you need for the kinds of presentations you create. When it comes to creating a presentation, both PowerPoint and Keynote offer a selection of themes that include complementary backgrounds, fonts, colors, and styles; you can start from one of these or create your own theme. Within a theme, you can choose from among numerous layouts, such as a title plus bullets or a captioned photo, for any given slide. In either application, adding a new slide with the same layout as the previous one is as simple as selecting the existing slide and pressing Return. If you want a different layout, PowerPoint lets you add a new slide with a given layout in one step, by choosing it from the pop-up New Slide control on the Ribbon’s Home tab. But in Keynote, you must create a new slide first and then apply a different master to it—either using the Appearance tab on the Slide Inspector, or by displaying the master slides in the sidebar and dragging a master onto the new slide. This two-step process is awkward, especially when you must repeat it many times. When building slides with numerous objects, such as a series of graphics that will occupy the same spot on the slide in sequence, each application offers its own twist. Both let you change an object’s front-to-back position using commands such as Arrange -> Bring Forward or Send Backward. In Keynote, you can go further by using a Smart Build to arrange a series of graphics, including animations between them, and reorder them by drag and drop. That’s useful, but PowerPoint’s new Arrange -> Reorder Objects command is even better. It displays a 3D view in which each object on your slide (not only graphics, but also text boxes, tables, charts, and so on) is on a separate layer; you can then click and drag to reorder the layers. Even if you’re a dynamic speaker, adding graphical elements to your presentation can help keep the audience’s interest and illustrate your points. In either program, you can display a media browser that lets you insert photos and videos from your iPhoto, iMovie, and iTunes libraries; PowerPoint also includes a selection of several hundred pieces of clip art. Once you’ve added a graphical element, you can apply various modifications and transformations, such as adding a shadow or reflection, changing opacity, or adjusting contrast and tint. PowerPoint offers a much greater variety of effects (which can also apply to text, tables, movies, and other presentation elements), including 3D rotation and artistic filters much like those in Photoshop; Keynote offers neither, although it does a better job of making the effects it does have accessible and pleasing to the eye. PowerPoint 2011 offers 31 entrance effects, versus 17 in Keynote ’09, but Keynote’s effects tend to be more striking. Both applications now let you mask an image with a shape—that is, hiding the parts of an image that aren’t part of the shape you select. 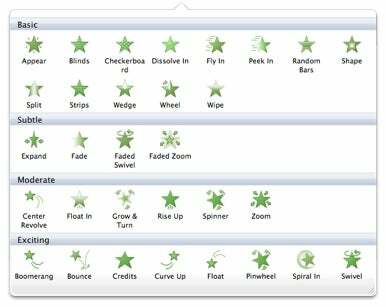 Keynote gives you a choice of 12 such shapes; PowerPoint offers well over 100. However, I found it easier to position the mask and resize both the mask and the underlying image in Keynote, whose interface is clearer and simpler. On the other hand, I found PowerPoint’s Remove Background tool to be far more effective than Keynote’s Alpha tool. Both let you selectively mask out the backgrounds of images, but PowerPoint’s version is much better than Keynote’s on photos with complex backgrounds, often requiring just one or two clicks to isolate the subject. Keynote’s Alpha works well when backgrounds are largely uniform in color and is more intuitive to use, but requires tedious fiddling when the background is not uniform or when the foreground and background are similar in color. For graphics-heavy presentations, especially when the graphics require considerable manipulation, PowerPoint provides better-quality results, and with much less effort, than Keynote. Transitions from one slide to the next can be as simple or as flashy as you want, in either application. Both have a wide variety of 2D and 3D transition effects, and I found them roughly equal overall in visual impact. Keynote has a selection of text and object effects that leave a slide’s background in place while changing its content; one such is the much-hyped Magic Move transition, which automatically moves and/or resizes objects without requiring each one to be animated separately. PowerPoint has no exact analog for Magic Move, but produces a comparable range of effects with its selection of seven Dynamic Content transitions. 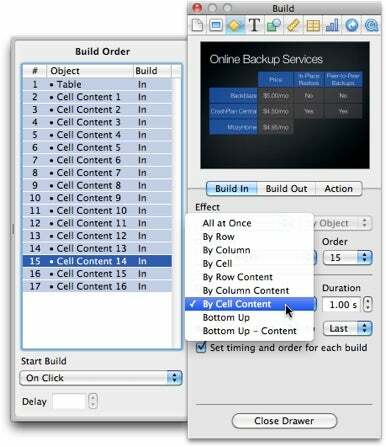 Keynote ’09 lets you animate a table easily, yet gives you cell-by-cell control if you need it. Both PowerPoint and Keynote provide a great many ways to animate individual objects on a slide. You can apply a special effect when the object appears or disappears, as well as intermediate effects for emphasis such as changing size and rotating. PowerPoint offers nearly twice the number of entrance, exit, and emphasis effects as Keynote does; Keynote makes up for a smaller quantity with more visually impressive effects such as Comet, Flashbulbs, and Flame. In both applications, you can animate an object by specifying a path for it to travel—anything from a simple line to a complex hand-drawn squiggle. In Keynote, an object’s path can be broken into segments defined by transition points; for each segment, you can individually trigger movement and adjust the speed, if you like. By contrast, in PowerPoint each path (regardless of how many points it has) represents a single continuous motion, so if you want the object to change speeds, you have to add multiple paths. PowerPoint forces you to choose one of only five preset animation speeds for any path, while in Keynote you can set the exact length of time the object takes to traverse each segment. Keynote also makes it simpler to combine animation effects, such as spinning while moving along a path—you can do it in PowerPoint, but it takes more work. If you want to animate the contents of a table—for instance, having each cell appear individually, with an accompanying flash—you can set this up in Keynote in a couple of clicks. PowerPoint has no way to animate tables, so getting the same effect would mean creating a separate text block for each table cell and applying the desired animation effect to each one individually. Overall, Keynote’s transitions and animations are more flexible, easier to use, and more visually appealing than PowerPoint’s. Once your presentation is done and you’re ready to show it to your audience, PowerPoint and Keynote offer similar capabilities for live presentations, including dual-display support, presenter notes, a preview of the next slide, and a timer. But I frequently give presentations remotely, and although PowerPoint and Keynote both offer ways to do this, they couldn’t be more different. In PowerPoint 2010, you can choose File -> Share -> Broadcast Slide Show to upload your presentation to Microsoft’s servers in a way that lets you present it live to other people. After you’ve shared it, PowerPoint gives you a URL you can distribute to viewers, who can then open the presentation in their Web browsers; as you step through the slides on your Mac, all the viewers can follow along. Although this process works, it assumes you have some independent means of communicating with your audience—for example, setting up a conference call in Skype so they can hear your voice as well as watch the slides. Both applications let you share presentation files online as well. In PowerPoint, you can choose File -> Share -> Save to SkyDrive and log in with a Windows Live ID (free to create, if you don’t already have one) to store the file on Microsoft’s servers. You can then log in at www.live.com to view or edit the file online, and to share it with others you designate. In Keynote, you can choose Share -> Share via iWork.com to upload your presentation to Apple’s servers—again, optionally designating those to whom you grant access. But I find both solutions cumbersome and unnecessary; if I wanted to share a presentation either publicly or privately, I’d be more inclined to use a generic file-sharing tool such as Dropbox. For live presentations, I consider the two applications equally good; for remote presentations, Keynote’s superior integration with iChat Theater makes it the clear winner. You can create impressive, professional presentations in both Keynote ’09 and PowerPoint 2011, and can do so more easily, and with more pizazz, than in the previous versions of each. But each has its unique strengths. For rapidly building a complex presentation with multiple slide layouts, PowerPoint has the edge; it also has superior graphics handling, easy-to-use flowcharts, and loads of 3D options. If you want to animate tables, move objects along a complex path, give a presentation remotely using iChat Theater, or wow your audience with amazing transitions and effects, Keynote is the better choice. I’m glad to have both.